Upon receipt you may either place an order by telephone or email us an Offical Order. We would then contact you by telephone to arrange payment and any special delivery requirements. 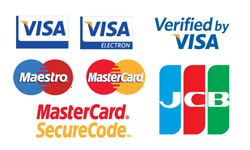 All Major Debit and Credit Cards are Accepted (except American Express) or Payment may be made by BACS if preferred. Secure Card Payments are taken through our Cardsave (WorldPay) Merchant Account Virtual Terminal using Streamline Card Processing, for your security and peace of mind.